Over the years, I’ve developed a nighttime skincare routine. Between brushing my teeth and dozing off to sleep, I use a trio of products* to get me started on the right foot for some beauty sleep. To prevent dryness and to give my feet some pampering, I use L’Occitane’s shea butter foot cream. This product keeps my feet hydrated all year round, but it really shines during the long Chicago winter, where it’s the only thing keeping my feet from succumbing to the bone dry cold. Now that my feet are taken care of, on to my arms and legs. I use L’Occitane’s Concentre de Lait firming body lotion to keep dry patches and flaky skin at bay. Bonus: it smells delicious, with a light, non-chemical smell. And lastly, I keep my lips happy with Korres lip butter in jasmine. I dab a little of this stuff all over my lips. It feels light and silky , and it does a good job of moisturizing my lips while staying put all through the night. 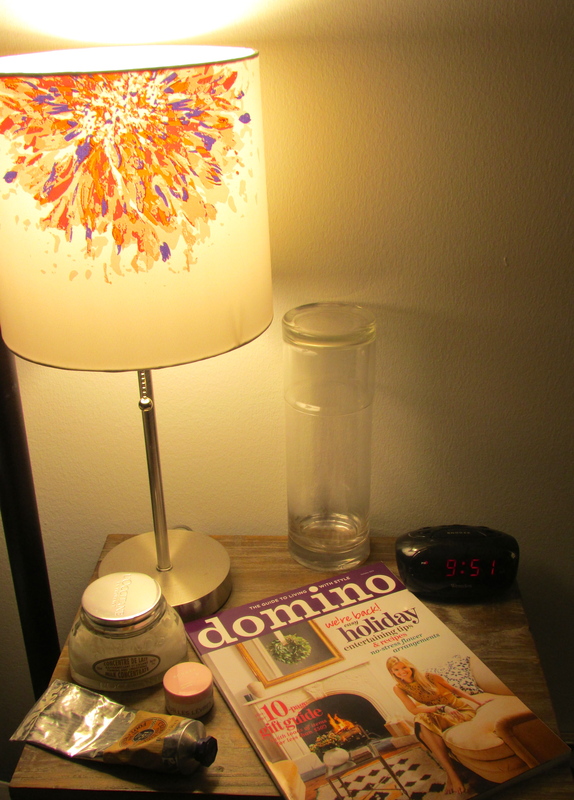 I keep all three in my nightstand drawer for easy access and to lower the chance of me lazy-ing out of doing it. Usually by the time I get done with my lips, I’ve decompressed enough to start to get sleepy, but if I’m in need of a little help, I usually do some light reading, for 15 minutes or so, either catching up on my magazines or browsing through some of the day’s headlines online. Currently on my nightstand? 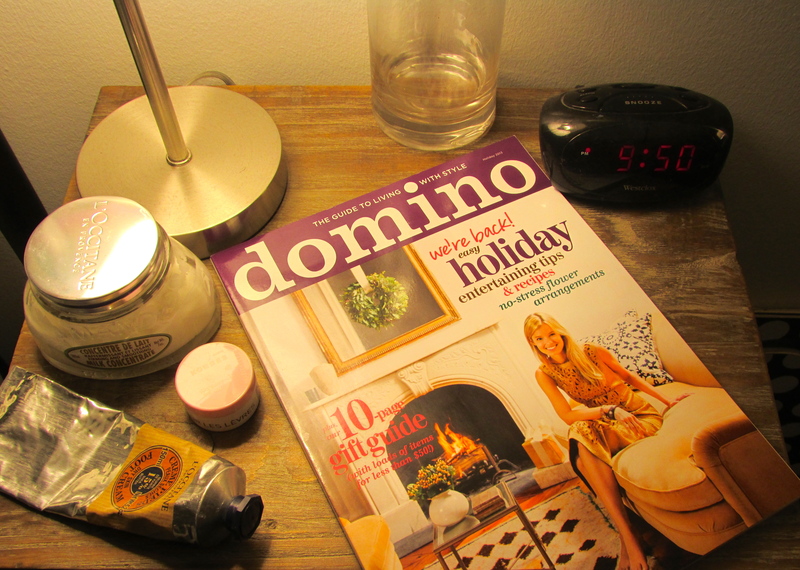 The holiday issue of the newly revived domino. I’m reading it slowly little by little, to savor every last bit. Do you have a bedtime routine? *for skincare; my face cleansing routine is a little more involved…more on that soon! Will do! And I’m with you on getting excited about stuff like that…it’s like a little treat!